Riding bicycles is hot again! We checked out the brand new ultra glam Bike Studio in Salt Lake that’s adorned with imported Ferraris, Lamborghinis, and other brands. They also have something sweet cooking next door (we smell cookies)! Whether you’re a toddler, teenager or someone rocking silver hair, the Bike Studio has something for you to ride on! Their high-end models have been receiving all the attention – the bright red finish and carbon fibre body of the Ferrari issuper! But they offer other, more affordable options as well. Starting at around INR 5,000, the Bike Studio has models that’ll help you choose a healthier lifestyle, be environment friendly and simply have fun riding on the road! We spotted the coolest Fat Bike with thick tires and an orange finish, suitable for snow, sand and more than perfect for Kolkata roads – *wink*. Wait, there’s more! There’s a Sweetish House Mafia opening right next door where you’ll get freshly baked cookies, coffee and a variety of shakes and sundaes! They wanted to provide a comfortable space for customers, specially since a lot of them buy high-end products and would want to sit down and discuss. Even if you’re not buying a bicycle, you can drop in for some Nutella Sea Salt (INR 130) or Double Choco-Chip cookies (INR 95)! Pair it up with an Affogato (INR 160) or some tea. They follow the ‘everything under one roof’ model. In case you want to choose a colour or some specific add-ons for your bike, they can customise it for you. And they also service its parts. 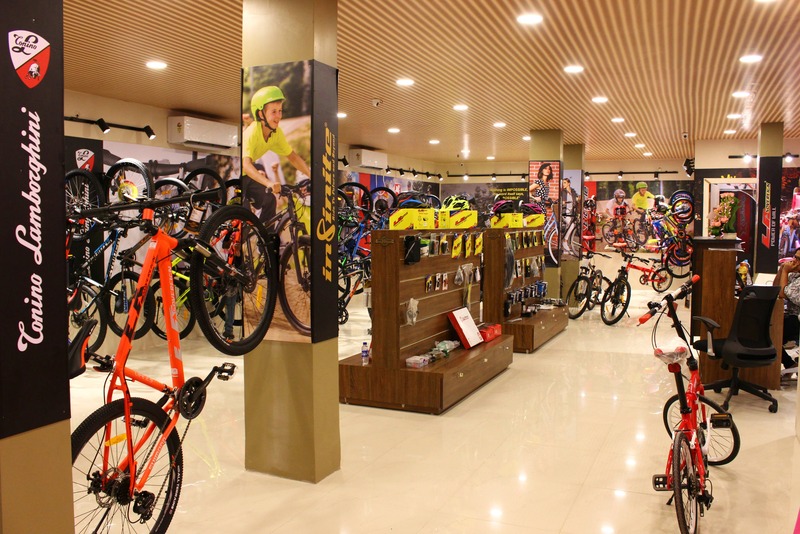 Their stores are spread across 15 cities with diverse brands such as Ferrari, Lamborghini, Romet, LA Sovereign, X-Bicycles. Foldable, light frames, these bicycles are easily portable and can be carried along on your next road trip. And Salt Lake and New Town are great places to put the pedal to the metal with cycle lanes and some pretty scenic parks. As more people join in on this two-wheel adventure, options are bound to open up. Happy ridin’!